Life Teen Summer Camp is an incredible week of fun, activities, prayer, time with friends and growing in your faith. What is Life Teen Camp? Summer Camp with Life Teen is an incredible opportunity to bring your teens into a profound experience of life. 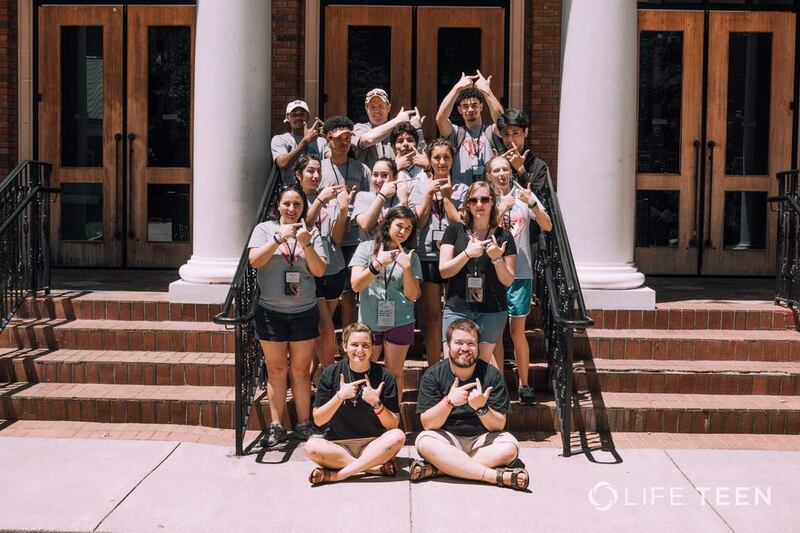 For over 1O years, Life Teen has provided experiences at summer camp where your teens are able to be free and confident in themselves, develop new friendships with other teens from your parish, and encounter God working in their lives. What happens at Life Teen Camp? Multitude of opportunities to experience God through the Sacraments, including daily Mass, confession every morning and night, and Eucharistic Adoration. Our desire is for every teen to leave camp with a stronger relationship with Jesus Christ. Teens will hear powerful talks from relatable, funny, and challenging hosts, along with prayerful and engaging praise and worship music from music ministers. Every session is crafted to assist teens in examining their lives and growing in their faith. Camp is the perfect time to strengthen existing friendships and create new ones! You&apos;ll journey through camp alongside your parish, while also encountering hundreds of other campers from around the country. We arrive as a parish group and leave camp as family! Zip lines, rock walls, to leap of faiths, white water rafting, messy games and obstacle courses that are fun and challenging...ropes courses designed for personal and team growth where individuals can learn to overcome personal fears and challenges while relying on their friends for help. Payment options available, please speak to Marlen to make arrangements. (we will be sharing a bus with St Anthony&apos;s in North Beach) We will have opportunities to fundraise to help offset some of the cost. Check out the Camp in Action! Watch this unforgettable week & try and spot the crew from OLHOC! How many are you registering for Camp Covecrest? REQUIRED Please fill out this field. In order to register as a chaperone you must first talk to Marlen. Chaperones must be VIRTUS compliant and per Camp Covecrest rules, there is also a limit as to how many chaperones we can take. Current grade/Chaperone REQUIRED (Select One) 8th 9th 10th 11th 12th Chaperone Please fill out this field. T-shirt size REQUIRED (Select One) Adult small Adult medium Adult large Adult X-large Adult 2X Adult 3X Please fill out this field. If you would like to make a payment for Camp Covecrest NOW: $ Please enter a positive decimal. Transportation (TBD - we will let you know asap) $ Please enter a positive decimal. You can pay either the full amount or your payment with credit card below. If you prefer to pay with cash or checks, click PAY LATER. If you would like to receive an email confirmation: Please enter an email address.